Metal forming (engineering) for a large workpiece through stamping/molding process depends on many factors/variables such as the material of such workpiece, mold, pressure force and others. With smart process monitoring, the press hardening of lightweight parts can be seamlessly traced and documented. The process of press hardening, also referred to as hot stamping in the metal forming industry, depends on a number of influencing factors: the exact temperature of the red-hot blanks when leaving the furnace, the amount of time that passes before they are placed in the die, the press force applied, and many other things. All of these parameters have a direct effect on the quality of the parts, which is why it should be possible to seamlessly document and, in the case of any doubt, track and trace these parts with pinpoint accuracy. The first system that Schuler networked with the solution’s software was its hot stamping line in the Hot Stamping TechCenter at the company headquarters in Göppingen. Video and thermal imaging cameras provide a real-time overview of the blank feed, transfer and parts exit sections, all while the system continuously records and documents process data (referred to as “process monitoring”). The information is collected by the numerous sensors installed in the press, die, furnace and cooling units. These powerful sensors detect even the slightest changes in temperature, pressure, vibration characteristics and flow rate in intervals measuring just fractions of a second. 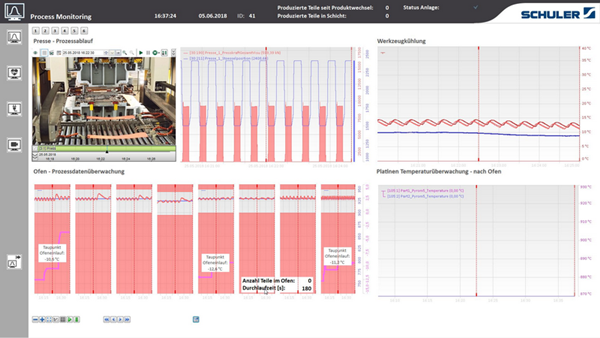 As this is happening, the process monitoring system from Schuler is able to not only combine the huge quantities of data collected by the sensors at many megabytes per second, but also to synchronize this data across all of the different interfaces. To ensure that the correct and necessary information is available at any given moment, algorithms analyze the data and keep the amount of memory used to a sensible size. This makes it possible to visualize long-term trends for various different types of process data. The solution gives system operators a way to track and trace each and every hot stamped part down to every last detail and, with the help of data histories, check whether blanks were heated to a high enough temperature, kept in the press long enough, or were cooled in the proper amount of time. 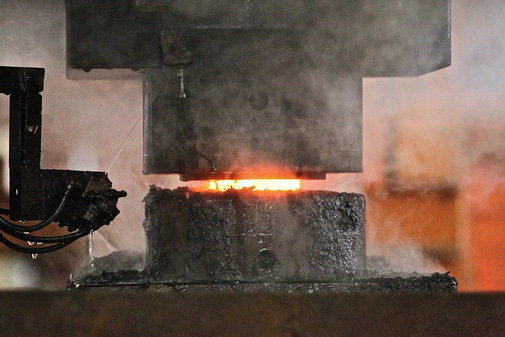 Possible error sources or causes of production disruptions can be identified at a glance—whether a burner in the furnace has suddenly failed or the hot stamping die has steadily lost precision over time. 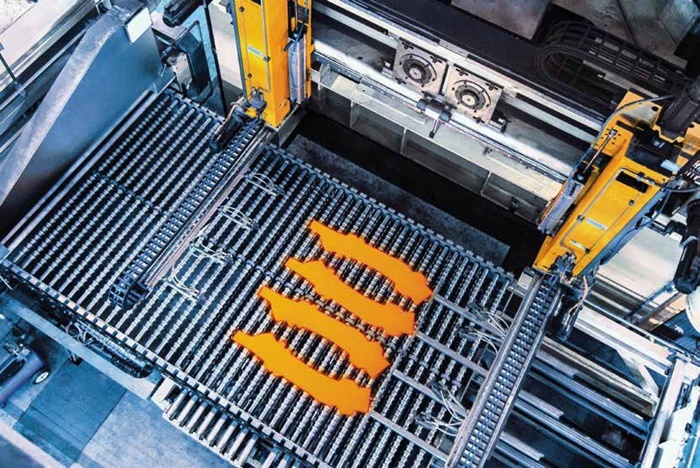 Manufacturers, especially those of safety-related components, are currently facing growing demands from a number of different areas calling for the ability to account for the continued existence of optimal production conditions, e.g., for hot stamped B pillars, over a span of many years. The newly developed solution from Schuler—which goes by the title Machine Monitoring System (MMS)—also detects any instances where a system operator manually adjusts settings on the line without documenting the change. 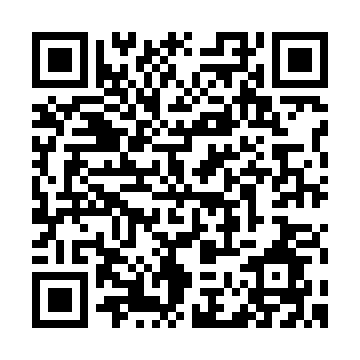 This also ensures that no critical information is lost in the communication with production management, for example. Not only does the software run on-site in the line control, it can also be used everywhere else as a standalone application on any Windows computer. From these other computers, users can access data on the company’s secure network over a protected connection. Schuler also plans to incrementally expand the system to include additional functionality, such as predictive maintenance.